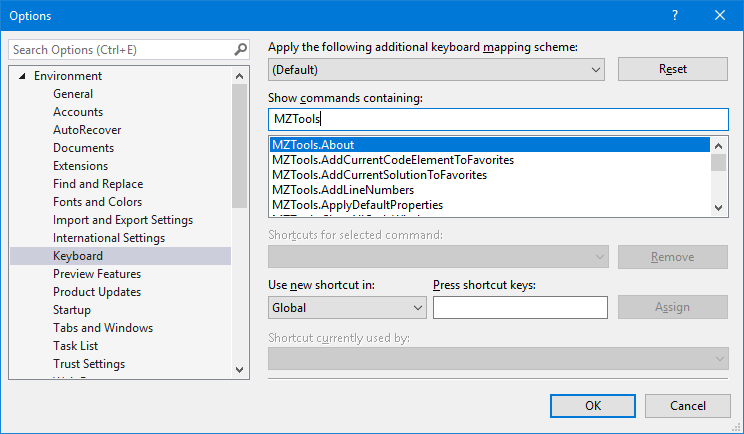 The Keyboard Shortcuts section of the Personal Options tab explains you how to assign keyboard shortcuts for the MZ-Tools features (and for the exception / error handlers and code templates that you create). 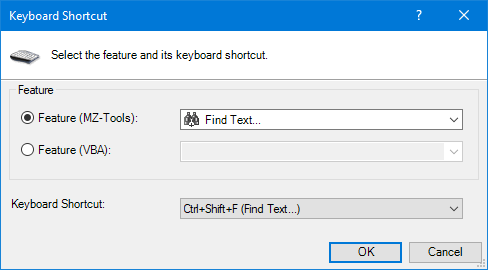 The way to define keyboard shortcuts is different for Visual Studio and for other IDEs. In this window you select a command (the MZ-Tools commands start with the MZTools8 prefix), press the desired shortcut keys and click the Assign button. Toggle Bookmark, Next Bookmark, Previous Bookmark, Clear All Bookmarks and Redo, provided by the Edit menu and the Edit toolbar. Locals Window and Watch Window, provided by the View menu and the Debug toolbar. 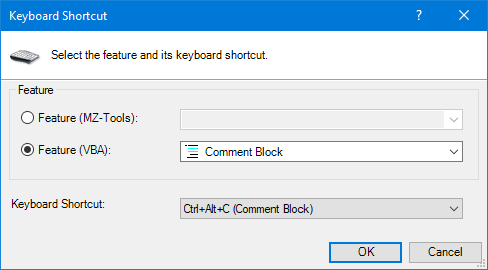 Comment Block and Uncomment Block, provided by the Edit toolbar (but, conspicuous by their absence, not by the Edit menu). If you are not aware of the Edit toolbar, you can make it visible right-clicking on any toolbar and checking the Edit menu entry on the context menu that is shown.